The Pixel XL is the first Android phone to deliver an emphatic, cohesive, surprise-and-delight experience. Samsung and the other Android phone makers have tried to give users something magical before, but they never quite made fetch happen. Even Google itself has toyed with a unified software/hardware gestalt via its Nexus phones, but those devices could sometimes feel like stripped-down vessels for disconnected software services. But in the Pixel XL we finally have an Android phone that directly competes with the iPhone in terms of holistic design. For this we can thank Google Assistant, which serves as a central entry point for all the Google services I’ve been using daily since I switched from the iPhone in 2014. Indeed, there’s no underestimating the value of having Assistant baked directly into the home button. It really ties the room together. And after using the Pixel XL for four days, I feel the phone is markedly more special than my Nexus 6P daily driver. Just a button-press away, Google Assistant ties together Google’s new mobile experience. The Pixel XL is expensive at $769, and unless you’re willing to buy it unlocked from Google, it’s currently only available from one carrier (Verizon). But let me make my case for the first fully Google-branded Android phone. Below I share why I love the Pixel XL, and why you have to consider it a leading candidate for your next phone upgrade. User interface design matters. A good smartphone interface sets the tone for the entire user experience, and in the 5-inch Pixel and 5.5-inch Pixel XL, Google delivers the best Android calling card yet. The new Pixel launcher—exclusive to the Pixel phones—replaces the full-width search box with a small Google button, and ditches the App Tray for a swipe gesture. The Pixel XL argument starts with a new home screen, which is currently exclusive to Google-branded Pixel phones, and apparently won’t be included in Android 7.1, the update that’s slated to arrive on Nexus phones in December (at the earliest). The Pixel home screen replaces Google’s full-width search box with a more demure button; ditches the App Tray button for a much more graceful swipe-to-view-apps gesture; and rescues Google Assistant from exile in the Allo app by fusing it to the Home button, where people will actually use and enjoy it. The Pixel phones are also the first devices to surface Android 7.1’s app shortcuts: Just long-press on an app icon, and you’ll get options to launch directly into specific behaviors. The Messenger shortcut is especially useful because it points to your most recent text conversations. Long-press on an app icon, and you may find shortcut options for specific behaviors. Most Google apps already support shortcuts, and an API opens up shortcuts to third-party devs. iPhone users won’t be impressed, but if you’re an Android enthusiast, and want app shortcuts now, you’ll need to buy a Pixel phone, as it’s the launch device for Android 7.1. The Pixel phones also come with an expanded live wallpaper gallery, and many of the new options are simply awesome. One live wallpaper pulls an image from Google Earth, showing what your specific location looks like from space, complete with current cloud cover. Another live wallpaper shows a serene series of color gradients that change according to the time and weather conditions. The Pixel’s data-driven live wallpapers add an extra surprise-and-delight element that marries tasteful design with Google’s unique data talents. There are a few more live wallpapers, and each marries art and design with big data in a uniquely Googley way. It’s trademark surprise-and-delight, and just like perfectly designed cupholders, they don’t improve performance, but they sure make driving the Pixel XL more enjoyable and increase pride-of-ownership. Google Assistant is currently available to all smartphones—Android and iPhone alike—via the Allo messaging app. But if you want the feature built directly into your phone’s home button, you’ll need to buy a Pixel or Pixel XL. Google Assistant feels a lot like Google Now, and it actually pops up when you voice “OK Google” into your phone. But in stepping beyond Google Now, Assistant adds some features that dive directly into your own personal knowledge graph. Ultra-specific searches of Google Photos are but an Assistant query away. Perhaps the biggest surprise-and-delight feature is Assistant’s daily briefing. When you voice, “What’s my day looking like?”, Assistant can reply with a localized weather report; details on your work commute; specifics about your next meeting; and details on any reminders you’ve set. You can deselect any of the elements above, and also define whether your daily briefing ends with an audio news report. I counted 48 podcast news sources on Google’s current feed. Google Assistant’s Daily Briefing can share data on weather, commute, calendar appointments and reminders, and can even end with an audio newscast. 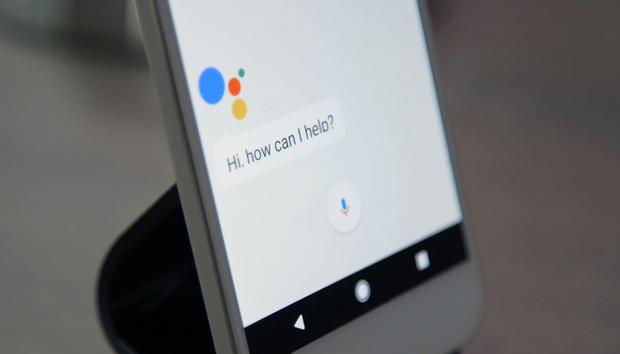 Google Assistant is also useful for hooking into Google services, and to this extent you may find yourself tapping many fewer app icons if you buy the Pixel. Voice “Navigate to the Grand Canyon,” and Assistant will push you directly into driving directions via Google Maps. Voice “Play Asteroids Galaxy Tour on YouTube,” and one of the artist’s videos will open accordingly. You can also get ultra-specific and leave the Google universe. For example, when you voice, “Play So What by Miles Davis on Spotify,” Assistant will deliver that song on the third-party app. Oddly, the version of Assistant baked into Allo is currently more advanced than the version built into the Pixel’s home button. The version of Assistant in Allo supports emoji games and email searches. For example, the Allo Assistant can dig into your Gmail, and search for emails that contain specific terms. Email search isn’t yet available in the Pixel’s Assistant, but my Google contact tells me this feature should arrive in the coming months. Similarly, you can play emoji games in Allo’s Assistant, but not in Pixel’s Assistant because, as my Google contact shares, “Emoji games are a family of games that sometimes require emoji input, which is not currently available with [Pixel’s] voice input.” Every Pixel comes with Allo pre-installed, but I still eagerly await the day when Pixel’s Assistant gets full text-entry support. I’d also love the ability to execute super-granular app requests. For example, the camera app magically launches into its video interface when you voice, “Take a video.” But when you say, “Take a slow motion video,” you’re just dumped into web search results. Am I asking for too much? Perhaps. But just the fact that I think Google Assistant might be able to drop me into slo-mo speaks to the power of the service. We cover the Pixel XL’s image quality—for both still photos and video—in our official review. So check out that article if you’re interested in the performance of Google’s 1.55-micron sensor pixels and video stabilization algorithms. For this report, I can only speak to the camera’s user experience, and I find it much better than the Nexus 6P’s. The Pixel camera app doesn’t expose DSLR-style manual controls, but there is a slider for exposure compensation, among a few other fine-tuning features. The camera app loads much more quickly, and from shutter snap to image save, everything about the Pixel XL’s software feels supercharged. Google still hasn’t added legit DSLR-style manual controls for focus, white balance, ISO and shutter speed, but there is a control for “exposure compensation,” which comes in handy for tricky lighting situations, and may be more meaningful to novices than DSLR controls. The two Pixel phones also carry over Smartburst and Lens Blur from the current Nexus phones. Smartburst lets you fire off a machine-gun flurry of shots by pressing and holding the shutter button. The software will then identify the highest-quality image from your salvo, and give you a quick command for keeping that best image and deleting the rest. Lens Blur, meanwhile, delivers a nifty depth-of-field bokeh effect. It doesn’t seem as intelligent as the iPhone 7 Plus’ Portrait mode, but it’s another surprise-and-delight feature that reinforces the greater Pixel experience. After you’ve shot a bunch of photos with Smartburst, you can grab only the best image, as indentified by the white dot. If the camera app teaches us anything, it’s that Google wants to deliver an Android phone for the masses—a phone that’s just as easy to use as the iPhone. But Google goes beyond the camera experience to deliver on that promise. For starters, Pixel owners in the U.S., Canada, and Australia will have access to 24/7 phone support. And if you really run into trouble, the support technician can even take over your screen. There’s also chat support (my preferred option) between 6 am and 9 pm Pacific time. I used this feature three times during my four days of testing, and my longest wait time was about 7 minutes. Google’s techs were helpful and to-the-point, and when one of my questions couldn’t be resolved immediately, the tech followed up with a response to my Gmail. Don’t scoff. You know you’ll be using the GIF keyboard. I also have to call out the new animated GIF selector in Google’s updated keyboard—because there’s nothing more mainstream-friendly than a shortcut for texting out a GIFstorm. Some third-party keyboards already support animated GIFs, but by including GIFs in its stock keyboard, Google makes a statement about the Pixel’s target audience: It’s not just going after Android nerds. It wants the mass market. Unfortunately, Google doesn’t do itself any favors by pricing the 5-inch Pixel at $649 and the 5.5-inch Pixel XL at $769. These prices are out of step with previous Nexus phones, and that runs the risk of alienating Google’s core Android fan base. What’s more, $649 and $769 represent the price ceiling for all premium phones. For example, an iPhone 7 Plus with the same amount of storage (32GB) also costs $769. Google mitigates the pain by offering free, uncompressed cloud storage for images and video shot by the Pixel, so perhaps customers won’t feel it necessary to upgrade to the 128GB Pixel XL, which costs a whopping $869. But the bottom line is that Google isn’t positioning the Pixel phones as loss leaders to sweep up new Android-curious consumers. Nonetheless, the Pixel XL makes a very compelling argument for itself. Everything about the interface feels much less busy than competing Android skins (especially Samsung’s). The phone is easy to use, but does a lot. And the Pixel XL really does feel almost iPhone-like in its marriage of hardware to software. It’s free of carrier and OEM bloatware, and Google’s own rockstar service (Assistant) is pushed to the fore. The Pixel XL is deliberate. It’s calculated. It’s curated. It may not offer IP68 water and dust resistance, wireless charging or optical image stabilization, but the Pixel experience feels extremely well-integrated, and its surprise-and-delight features are wonderful. This alone could sway consumers who wander into a Verizon store with no diehard allegiances to Samsung or Apple, and ask to see the latest hot handsets. I’d hazard to guess there are more “undecided” smartphone users than undecided presidential voters, and the Pixel XL has to be considered for their third-party votes. « Review: Google's new Pixel XL is a fine phone -- but is it really special?